In Songpan County of the Aba Tibetan and Qiang Autonomous Prefecture in Sichuan Province, the Yellow Dragon Scene Areas covers an area of 700 square kilometers. It is situated in the 3.6-kilometer Yellow Dragon Valley. The valley is covered by calcium carbonate sediment that is deposited in the shape of a golden dragon. The area boasts snow-covered peaks, waterfalls, primeval forests and gorges. The area is famous for its unique karst caves and rich flora and fauna. 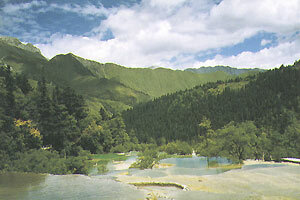 From the bottom of Yellow Dragon Valley (2,000 meters above sea level) to the top of the mountain (3,800 meters above sea level) are subtropical evergreen forests, deciduous and broad leaf forests, broad leaf and coniferous forests, sub-highland coniferous forests and highland brushes and grassland. 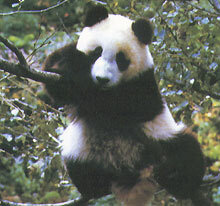 The forests are home to dozens of rare animals,such as the giant panda and golden monkey. This areas is famous for its majestic, spectacular, fantastic and wild scenes.